124th Cavalry Association - Marsmen! A Gold color metal and enamel device 1 1/2 inches (3.81 cm) in height consisting of a shield blazoned: Per bend Or and Sable, a lion sejant of the last grasping the astronomical symbol for Mars Vert. Attached above on a wreath of the colors Or and Sable, a mullet Argent encircled by a garland of live oak and olive Proper. Attached below and to the sides of the shield a Gold scroll turned Green inscribed "GOLPEO RAPIDAMENTE" in Black letters. The lion and the symbol for Mars commemorate the Regiment's service in World War II in the Central Burma and India-Burma campaigns. The lion is taken from the seal of Burma. The astronomical symbol for Mars, protector of soldiers, refers to the Mars Task Force with which the organization fought in World War II. The crest is the seal of Texas, the "Lone Star State." The motto translates to "I Strike Quickly." The distinctive unit insignia was originally approved for the 124th Cavalry Regiment on 6 April 1935. It was redesignated for the 124th Mechanized Cavalry Reconnaissance Squadron on 29 August 1949. It was redesignated for the 124th Cavalry Regiment and amended to add the crest and symbol for World War II service (lion grasping the astronomical symbol for Mars) on 5 January 1967. Per bend Or and Sable, a lion sejant of the last grasping the astronomical symbol for Mars Vert. That for the regiments and separate battalions of the Texas Army National Guard: On a wreath of the colors Or and Sable, a mullet Argent encircled by a garland of live oak and olive Proper. GOLPEO RAPIDAMENTE (I Strike Quickly). The lion and the symbol for Mars commemorate the Regiment's service in World War II in the Central Burma and India-Burma campaigns. The lion is taken from the seal of Burma. The astronomical symbol for Mars, protector of soldiers, refers to the Mars Task Force with which the organization fought in World War II. The crest is that of the Texas Army National Guard. The coat of arms was originally approved for the 124th Cavalry Regiment on 15 April 1935. It was redesignated for the 124th Mechanized Cavalry Reconnaissance Squadron on 29 August 1949. 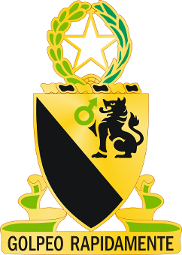 The insignia was redesignated for the 124th Cavalry Regiment and amended to add a symbol for World War II service (lion grasping the astronomical symbol for Mars) on 5 January 1967.